The USB socket on this side of the 2510p notebook is noted to be powered but that is odd because it does not look anything like the powered usb spec.. Initially this caused concern to me because I would like to run a mouse on the other port and I understood that one might not be powered. This is not the case however, a mouse runs find off the other port. The HP Compaq 2510p is a fairly average machine for the asking price. Sure, its light weight and the build quality are highly impressive but we were let down by the rather average battery life. The HP Compaq 2510p is a laptop built to serve two purposes - easy portability and ability to perform general computing tasks.The HP Compaq 2510p executes these functions pretty well, but don't expect it to run resource hungry tasks of any sort.At around £1,500, this might seem expensive, but that's the premium you need to pay for the hard-to-achieve combination of compactness and high battery life. With time, as prices of solid state drives fall, we hope HP introduces this option here as well (currently available in the US). For now, if you want portability and long battery life, the Compaq 2510p will serve you well. That booming noise you just heard is Compaq/HP firing a shot across the bow of the USS ThinkPad. With its new 2510p, the company is showing it can compete—and beat—Lenovo and others at the ultra-portable business notebook game. This is a notebook brimming with all the latest and greatest portable technology, and is one of the best ultra-portables available. The 2510p is a highly-anticipated ultra-portable notebook from HP Compaq (seriously, can’t they just pick one name and stick with it?) that is aimed squarely at business users who demand portability over all-out performance. It’s been completely redesigned and packs all the latest in portable technology. An ultra-portable notebook lives, and dies, by two metrics alone: battery life and weight. On the battery side of things, HP has packed an Ultra Low Voltage Core 2 Duo Processor, which should do its part to boost battery life since it merely sips CPU juice rather than guzzle it like its standard-voltage counterparts. As mentioned above, the 2510p has a 12.1-inch display with 1,280 by 800 resolution. We think the latter is a good compromise between a too-small Windows desktop and the too-tiny icons and menus of notebooks that cram ultra-high resolution into a screen size. Letting the laptop's ambient light sensor control screen brightness made things too dim for our eyesight, but our usual sticking with the top two or three brightness settings made backgrounds sufficiently white to enjoy vivid foreground colors and to read text without eyestrain. There were no bad pixels to be seen on our test unit's LCD. Along with Windows Vista Business and scads of IT management and security utilities, the HP came preloaded with Symantec's Norton Internet Security, InterVideo's WinDVD player, and Roxio's CD/DVD creation suite. 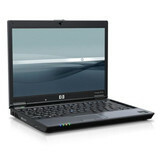 The HP Compaq 2510p is a 12.1" screen ultraportable notebook designed for business people that are frequently on the go. The Compaq 2510p replaces the older nc2400 ultraportable offering from HP. The 2510p improves upon the nc2400 by offering a touchpad, LED backlit display, the Intel Santa Rosa platform and a fresh new design look. 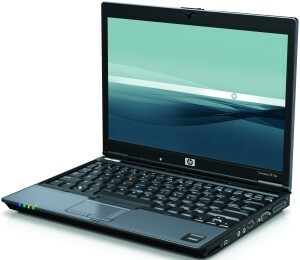 The HP Compaq 2510p is definitely a strong option in the ultraportable category. It improves on the previous Compaq nc2400 by offering a built-in optical drive while still keeping the weight about the same. The 2510p has a solid build and professional look. While it may not be as flashy as the competing Toshiba R500 or Sony VAIO TZ in terms of design, I think business people might prefer what I consider better usability, more durable build and more mature security and software suite the HP 2510p provides. The notebook isn't perfect, the pointing stick issue and average display brightness that doesn't live up to the "illumi-lite" billing that would lead you to expect a blazing bright display is dissapointing. Fans of ultraportable laptops have had a lot of products to be excited about in recent months, with two excellent models in particular standing out--the Toshiba Portege R500 and the Sony VAIO TZ150. Those are flashy consumer systems, designed to be thin, light, and eye-catching, but with high-end prices to match ($2,000 and up). HP offers a more business-oriented answer to these systems in the HP Compaq 2510p, which boasts similar stats but a more button-down design along with some corporate extras. Basic models start around $1,500, but our review unit cost $2,478, or about as much as the Portege R500 or the VAIO TZ150. Business features on the HP Compaq 2510p not found on the Toshiba or Sony units include hard-drive encryption and Intel's Active Management Technology (or AMT), which allows for remote IT management even when the laptop is powered off. 76.56%: This rating is not convincing. The laptop is evaluated below average, this is not really a recommendation for purchase.